I’ve never been a huge toast for breakfast person — unless you count that period of childhood where I used to slather Wonder Bread with loads of butter and shake on so much Sugar ‘N Cinnamon (from one of these characters) that it ended up looking like a sand covered beach toy. Yes, that happened. I guess toast always seemed a little plain, not super healthy and not very filling. Things changed once I found out that there are some healthy breads out there (like Sprouted Grain Ezekiel bread). I began to make toast more often and started experimenting with different toppings. I think this was also around the same time I was introduced to the world of nut butters beyond plain ol’ peanut butter. I’ve always had a deep love for peanut butter (it goes waaay back) but there are so many delicious varieties out there now and having toast for breakfast is just another way to eat more nut butter. Am I right? 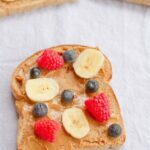 Nowadays I consider toast with peanut butter or almond butter one of my go-to breakfast options, especially on mornings when I’m running out of the house for barre class. 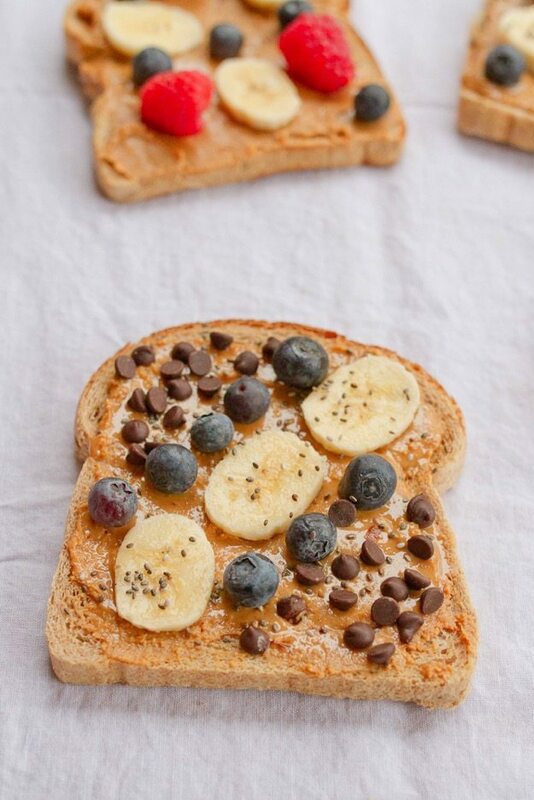 Toast, spread, sprinkle, place on a paper towel and GO! Breakfast toast is super easy to whip up and we always seem to have bread, nut butter and toppings on hand. 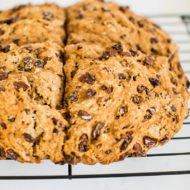 That’s one thing I love about the Food for Life bread and many other health-focused breads — they’re kept in the freezer so you don’t have to worry about it going bad quickly. I’ve also found that many of my health coaching clients love having toast with nut butter for breakfast. It tastes so good, it’s almost like a treat and something they look forward to. 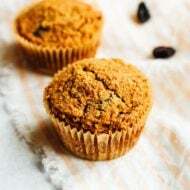 If you choose the right bread (whole grain is best), a natural nut butter and healthy toppings, you have yourself a health coach approved breakfast. 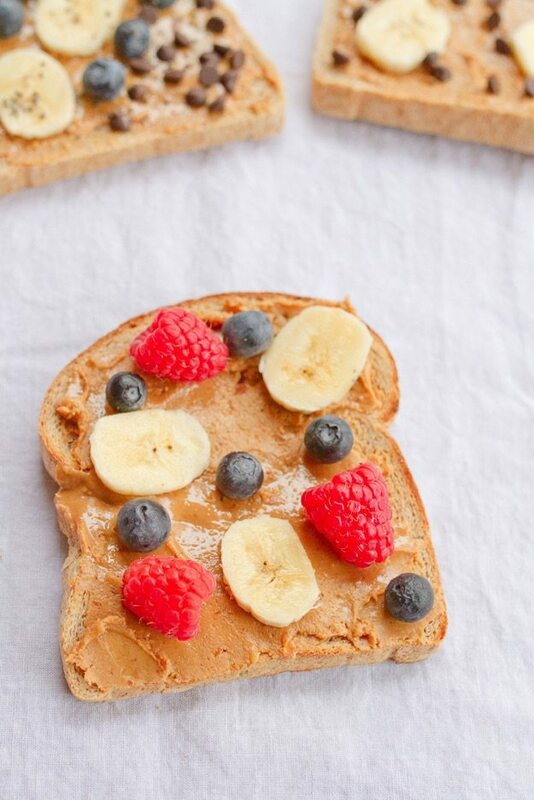 And don’t let the name fool you, this toast also makes a great pre-workout snack option as well. It’s easy to digest and has both simple and complex carbs to give you plenty of energy while you exercise. 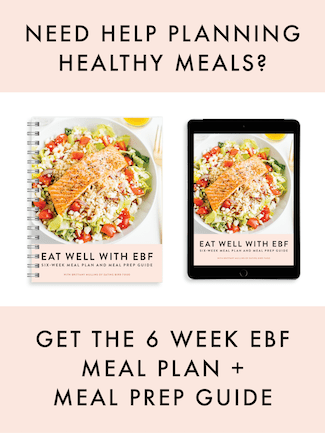 Need a quick and healthy breakfast idea? 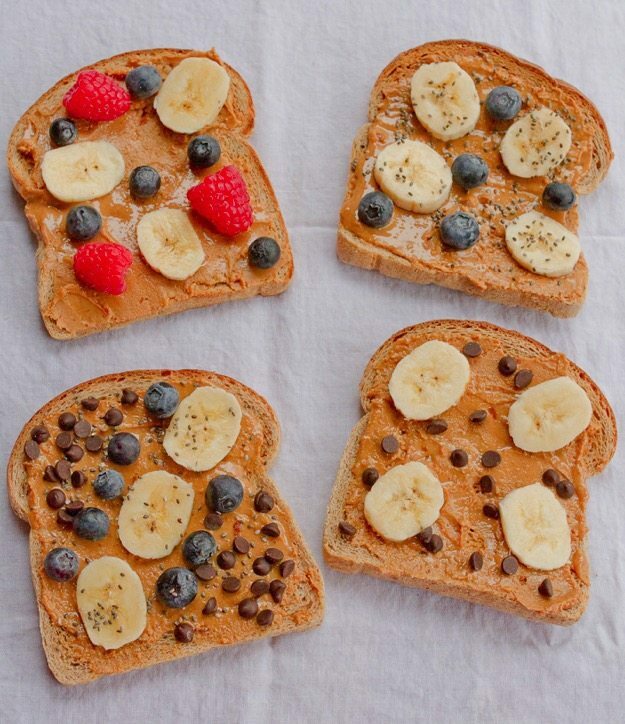 Toast up a slice a whole grain bread, spread on peanut butter or almond butter and top with your favorite toppings! Since there really isn’t a recipe, I thought it would be fun to share a few breakfast toast combos that I enjoy — some a little more decadent than others. For the base, choose a whole grain bread and spread on whatever nut butter you fancy. I used Reginald’s Homemade peanut butter here, but I love natural almond butter as well and you can use any type of nut butter your little heart desires. Nest step, load up on toppings, just like fro-yo! Keep it simple and healthy with Banana + Blueberries + Raspberries. Banana + Blueberries + Chia Seeds = cha cha chia! Banana + Blueberries + Chia Seeds + Chocolate Chips = same as above only better because there’s chocolate involved. Banana + Mini Chocolate Chips = peanut butter, chocolate and banana is one of the best combos ever! And who says you can’t have chocolate for breakfast? 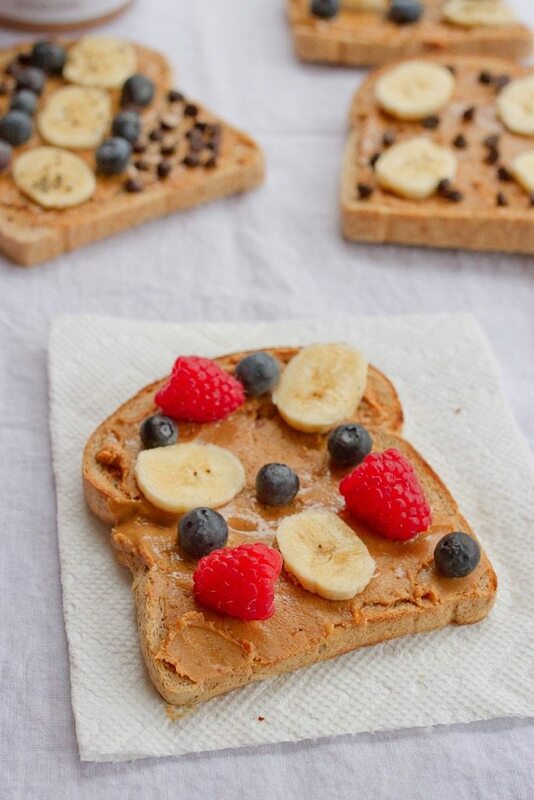 Do you ever eat toast with nut butter for breakfast or a pre-workout snack? What are your favorite toppings? I’ll take a slice of each pleaseeeeee. Yum! 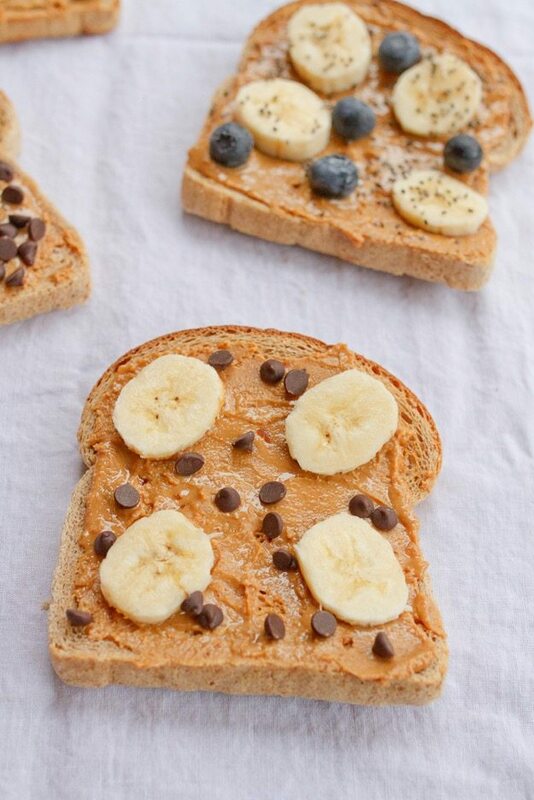 Peanut butter plus bananas on toast is my jam! Awesome post! I love mine with almond butter+apricot butter+hemp seeds+blueberries. Another good combo is cashew butter+coconut shredded+flaxseeds+bananas! Yum! I love blueberry and banana! I love toast with nut butter for breakfast! It really does taste like a treat. My favorite toppings are almond butter, banana, chia seeds, and honey! Sorry! 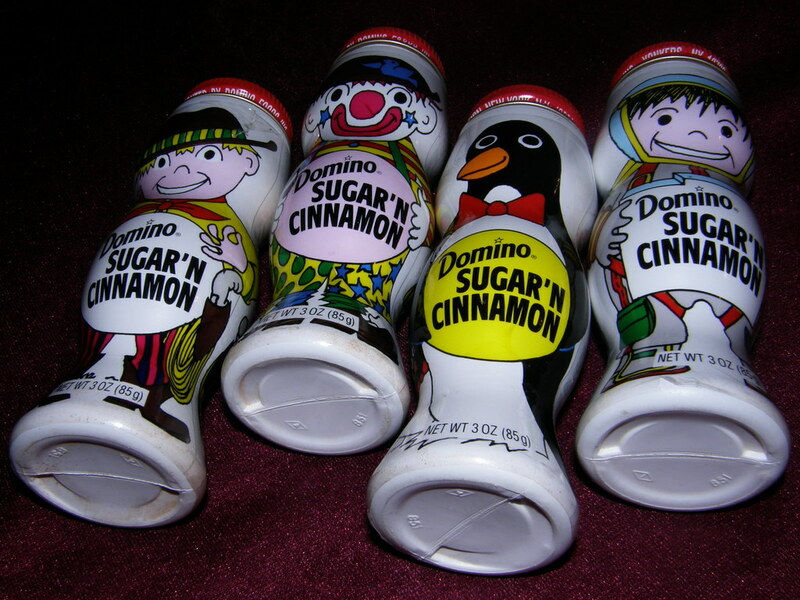 I ate just like you as a kid. Except we didn’t have fancy cinnamon and sugar mixed together. Had to add each separate. 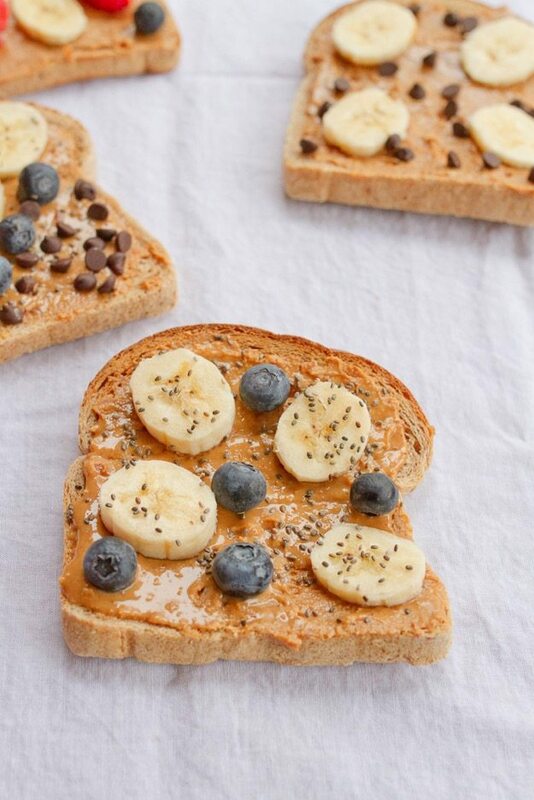 Toast with nut butter, bananas or pears is definitely a go to breakfast for me. Yum..Superb recipe.I love it.Thanks for sharing awesome post.Please describe me briefly about this one dish. Pb/banana toast is my go to when mornings are rushed!! Looks delish!! What type of bread did you use for your pics? It looks like the perfect size for a quick morning snack! I haven’t had just toast probably since college, mainly because I’m always hungry. How long do you normally stay full for after eating just one slice? I may try it again… Life has been so hectic lately! Oh man, Justin’s almond butter is sooo good. I love the vanilla and maple flavors too. Thanks for sharing dish like that. It is a new version of old breakfast. Awesome sandwich. What I do for my peanut butter toast is toast the bread and add butter then put it back in the toaster(I am aware this is probably not the best for a toaster but I’ve been doing it for years in my toaster seems to be doing okay) so the butter gets bubbly then take out of the toaster and add peanut butter. It is delicious!!!! How about peanut butter and strawberry jam? They also taste so good! Yummy! 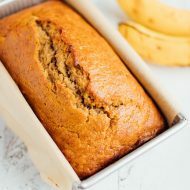 I loved the recipe- It reminds me of my childhood.